Skidmore College, Saratoga Springs, N.Y.
"Quote around map border by William Shakespeare: 'Who seeks and will not take once 'tis offered shall never find it more.'" 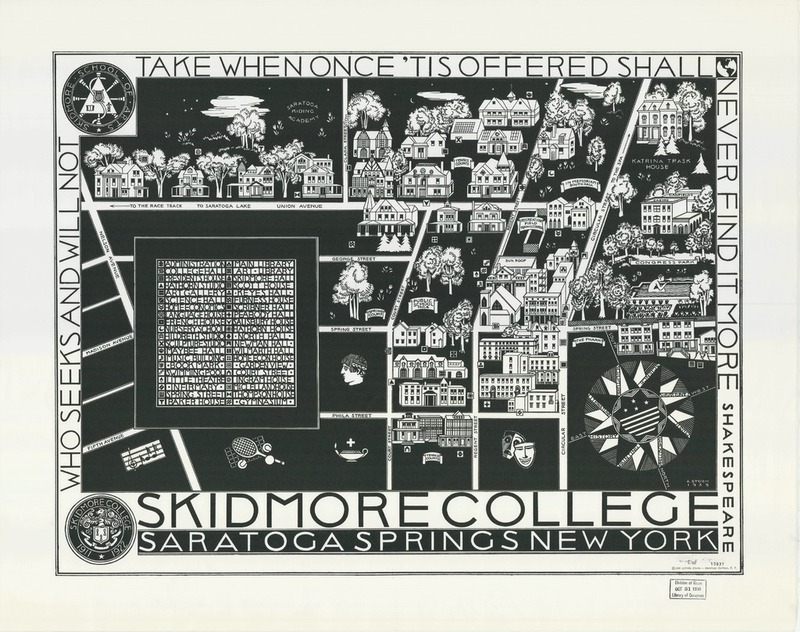 This pictorial map depicts Skidmore College in its first location downtown on Regent Street/Spring Street of Saratoga Springs (as opposed to its current location on North Broadway). Several images represent recreation and courses available at Skidmore College. In 1939, the College was an women's college for the Arts. Cartoon-like images depict music, tennis, religion, philosophy, theater, among other activities. Two school seals are drawn in the left hand corners. The seal at the top left represents Skidmore School of Arts while the bottom left represents Skidmore College and the traditional academic logo. In the right hand corner is a compass rose that includes some of the disciplines taught at Skidmore: Philosophy, Painting, History, Literature, Sculpture, Science, Languages and Music. Public School No. 4 is depicted in this map. This map is available in scarf format at the Tang Museum at Skidmore College. “Skidmore College, Saratoga Springs, N.Y.,” Skidmore Saratoga Memory Project, accessed April 24, 2019, http://ssmp.skidmore.edu/document/58.